It was really great produce. I expected the best and received the best. What if I get stuck with items I don’t want, or like? This is prevented two ways: When you first sign up you choose items on a “Do not like” list and we will never put those items in your box. The second; we have a unique subbing system so you can substitute out items from each order you do not need and choose from anything else on our menu you would prefer or want more of. We source from all organic farms in California and beyond to get you what you want. This allows us to offer a much greater selection of organic fruits and veggies and prevents our members from getting overloaded with too much of one item during harvest time. Is all of your produce local? As local as possible. Our produce is locally sourced with the exception of a very few items such as bananas, which do not grow in California. We believe in transparency and label every item as to its farm of origin. Members who want to eat only local produce have the option to sub these items out. Those who want more variety with their organic choices have greater selection. Check out our Farm Page for yourself and see where your produce was grown. We even provide contact info for each farm! What is your delivery area and when do you deliver? We deliver from Marin to San Jose, and from Martinez to Livermore and everywhere in between. We deliver every Friday. You may check your zip code and see a map of our delivery area here. What if I don’t need produce or will be out of town on my delivery week? No Problemo! From your Account Settings> Your Schedule you will find your delivery schedule for the next three months. Simply add or skip deliveries at anytime by clicking the box on your delivery day. We’re not a cell phone company! You may sign up for as long as you want and may stop deliveries anytime right from your Account Settings. We deliver Fridays to homes and businesses on Monday's on your choice of a weekly or bi-weekly basis. How will my produce be packaged? We deliver your produce in a plain bio-degradable cardboard box. This keeps the cost down for you and us. We do kindly request that you leave your box out during your next delivery so we can reuse or recycle it. We do everything we can to conserve. We only buy from farms that have achieved their organic certification according to the rules set up by the USDA. Everything we deliver is 100% USDA organic, no exceptions, no matter what farm. What happens if a farm fails to follow National Organic Standards? If you mess around with the FDA National Organic Program (NOP) rules, you can be fined quite a lot of money. NOP policy states, "A civil penalty of up to $11,000 can be levied on any person who knowingly sells or labels as organic a product that is not produced and handled in accordance with the National Organic Program’s regulations." Can I buy a box for someone as a gift? Of course! 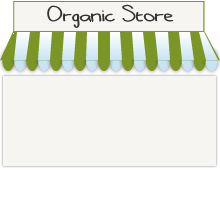 Just send an email to [email protected] // */ // ]]> and we will be happy to deliver your gift of organic produce for you. Do I have to be home for my delivery? What if I live in a place with secured access? We've got you covered! You don’t have to be home for us to deliver your box. When you sign up you will have a chance to leave special instructions for our friendly delivery drivers. Special access for our deliveries can usually be prearranged. Please send us an email with your concerns and we will work with you to ensure delivery. Why should I buy from your small business instead of a bigger competitor? We may be the smallest delivery service in the Bay but we try very hard to please. With the flexibility of subbing items in each order, adding or skipping deliveries at anytime right from your account, and access to near wholesale prices when adding additional items, our independent delivery service is much more convenient and provides a much greater value than our competitors. Simply put; you get more for your money with Golden Gate Organics (GGO). Take a look at what some of our customers say and decide for yourself. What if my order isn’t right? If you have a problem with anything just let us know and we will fix it. PERIOD. We pride ourselves in our fantastically amazing customer service (check out what our customers say!) It is not difficult to provide top-notch customer service, it is our pleasure and our purpose. I’m still on the fence. What do you recommend? There is no substitute for experience. I recommend you sign up for a small box of fruit and veggies and try it out 100% risk free. If you are not satisfied you may cancel right from your Account Settings anytime. We have three box sizes: small-$30, medium-$40, and large-$57. Each size has the option to be fruit & veggie, all fruit, or all veggie. I eat out a lot and won’t be able to eat it all. What would you recommend for me? For busy people on the go I recommend a small bi-weekly fruit box. That is one piece of fruit with breakfast, one for lunch and then a leftover for a snack. This way you still get your USDA recommended serving of fruit each day and you are still supporting organic farmers.